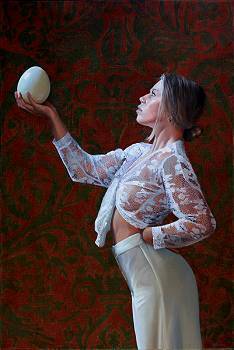 Contemporary paintings of models and still lifes that are often larger than the (still) life itself. 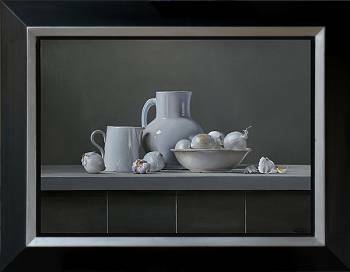 A fine painter with a loose touch that combines and enlarges classical and modern subjects freely and thus reflects the optimal balance between beauty, light and silence. Dirk Bal (1964) is a realistic artist and after a long search for the most suitable subject he has decided to stop the search and to choose the peace and quiet that he uses as a thread through his existence. His unstoppable urge for development sometimes stands in his way, but he always manages to surprise his surroundings. Realism, symbolism and the search for an almost ultimate balance, that he draws from the mathematical number sequence of Fibonacci, drive him to the state of wonder. That wonder, built up according to strict rules and principles, determines his apparent everydayness in his work. The purpose of his composition is to achieve acceptance in the paradigm of what is visible. As if we are struck by the beauty of simplicity in the carelessly passing by. One way or the other. 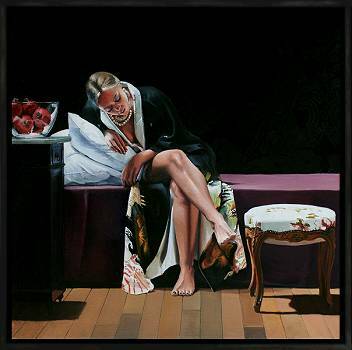 The still life, the model and a combination of these two are characteristic of the works that he creates. In his own unique way he almost combines the rules in the model, the symbolism and the still life. With Vermeer as one of his great sources of inspiration and according to Dirk Bal's total dependence on the light, he tries to record that silence every day. Dirk Bal, a seemingly everyday master who keeps searching for light. . silence.. balance and peace.